Gluten Free Sourdough Starter | Jovial Foods, Inc. Gluten Free Sourdough Starter | Jovial Foods, Inc. 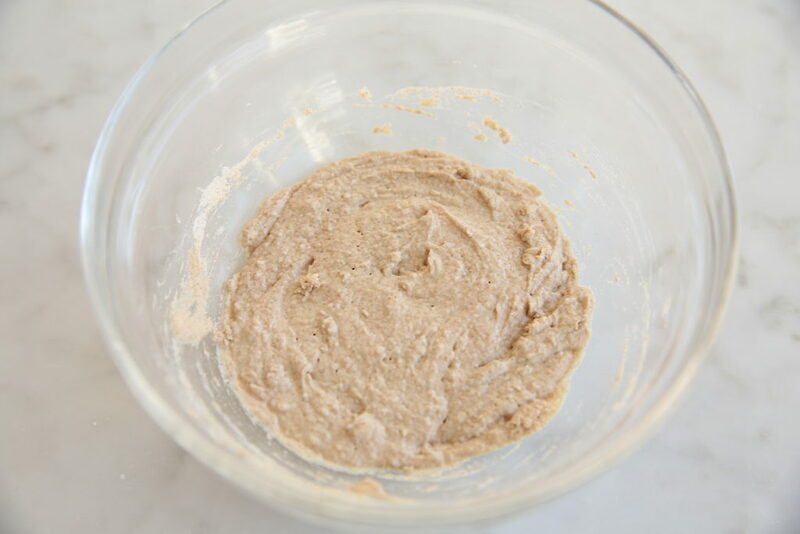 It might seem impossible to create your very own gluten free sourdough starter from scratch, but it actually is really easy and we believe it is the only way to make gluten free bread that tastes authentic and that will truly satisfy you like regular wheat bread. The sourdough process is magical, and it gives gluten free bread strength, great flavor, and nice texture. We find it easier to maintain and bake with a gluten free starter than it is with a wheat starter, so don’t feel intimidated by this process just because you are gluten free. You can do this, and we bet you’ll find tremendous satisfaction and joy in baking your very own gluten free sourdough bread. 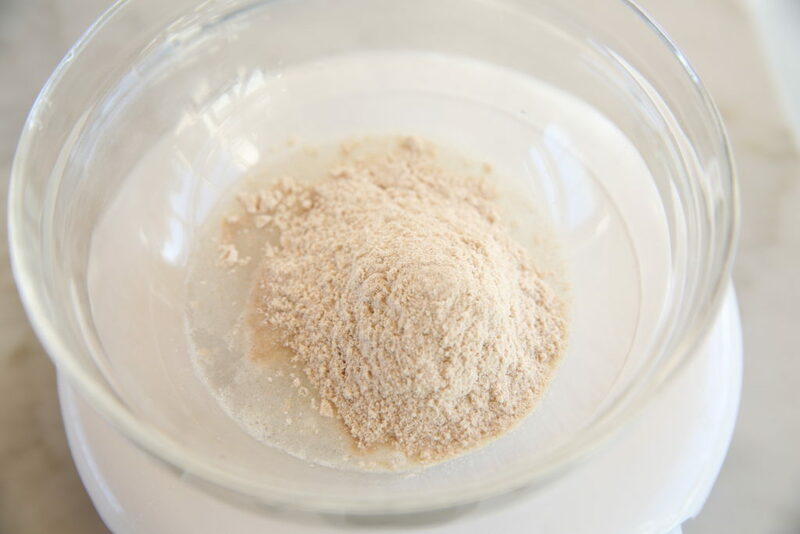 When you work with a sourdough starter and jovial’s Gluten Free Bread Flour, you are combining the best of both worlds – a healthier leavening process powered by wild yeasts together with a gluten free flour formula that is made with ancient grain flours and no added starches. Our flours provide added fiber and protein, and this is what gluten free bread is normally lacking, and when combined with the added strength sourdough will lend, you can bake breads with just flour, water, starter, and salt. Here is a brief introduction to the process, with the detailed recipe and instructions below. Gluten free starter is made from a mix of jovial bread flour and water. You start out by mixing a ratio of flour and water and letting the mixture sit out at room temperature until it starts to bubble. Each day you will take a small amount of the starter from the day before and add fresh flour and water. This process is called refreshing. You discard the remaining starter from the day before, only keeping the new mixture. It may seem wasteful, but you will discard less than you would if you kept adding to the same starter each day, because the ratio of flour to water to starter would just get bigger and bigger. You won’t use your starter to bake bread until it is ready, meaning it bubbles up within 6 to 8 hours of refreshing and goes from a sharp smell to a yogurty aroma. At this point, wild yeasts have multiplied enough to rise your bread and the pH is correct. Once your starter bubbles up within 6 to 8 hours, you can store it in the refrigerator in a sealed container. When you want to bake bread, you take what you need from the refrigerator until it runs low, then you refresh it to replenish your supply. We recommend refreshing your starter once a week for the first few months to keep it strong. It does take a few months for your starter to reach its full maturity and potential, so just keep in mind your bread will just keep improving the more you bake. It took us months to develop this and a full collection of sourdough bread recipes, tweaking the amounts of gluten free flour and liquids each day of testing. We know you will have success if you use a digital baking scale to measure each ingredient in grams, like we do. Measuring in cups is not accurate and will lead to inconsistent results. Trust us when we say it is worth the investment in a scale if you do not already have one. We want your bread to come out just as good as ours! In a small glass container that can be tightly sealed with a lid or plastic wrap, mix the flour and water until most of the flour is absorbed. A few small lumps may remain in the mixture. Tightly cover and let rest at room temperature for 24 hours. In a small, clean glass container that can be tightly sealed with a lid or plastic wrap, mix water into the starter until dissolved, then mix in the flour until it is absorbed. A few small lumps may remain in the mixture. In a small, clean glass container that can be tightly sealed with a lid or plastic wrap, Mix water into the starter until dissolved, then mix in the flour until it is almost absorbed. A few small lumps may remain in the mixture. Today is the first day you will refresh your starter, which you will repeat once a day until it rises up and forms bubbles within 6 to 8 hours. That may happen after a week, or it may take a few days longer. This is where the patience comes in, as the process does vary from kitchen to kitchen. 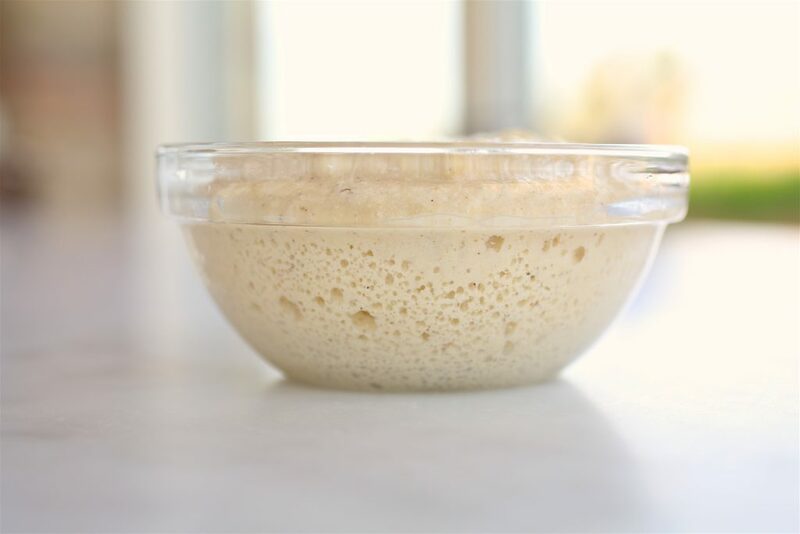 People always ask, “How will I know when my starter is ready?” Until you see your starter bubbling in this time frame, your starter is not ready for baking bread. Storing the starter in a clear glass container can help you observe the progress better. Until your starter is strong, you will only use a small piece to refresh from Day Five onward (just 2 teaspoons or 10 g) and discard the rest. For us, it took about 10 days to get good bread from our starter. We began baking bread after a week, but the bread baked dense, as you can see from the picture below. Then, magically, a few days later and continue refreshing, our loaf rose beautifully. At the point, we were able to refrigerate our starter, but we used it every weekday to bake bread. The more you bake, the more your starter will develop, and the better and better your bread will turn out. Once your bread is rising, you only refresh your starter when it runs low, so there is no more waste. Place the starter in a small, clean glass container that can be tightly sealed with a lid or plastic wrap. Add warm water and mix until the starter is dissolved. Add flour and mix with a fork until most of the flour is absorbed. A few small lumps may remain. Tightly cover and let rest at room temperature for 6 to 12 hours hours until the starter has bubbled up considerably. At first, this may take longer. Do not leave your starter at room temperature for more than 24 hours. Watch the starter closely each day. As it becomes more active, the amount and size of the bubbles in the starter will increase significantly and will change the appearance of the starter. When the starter rises up and doubles in size after 6 to 8 hours, you are ready to bake bread! Once your starter is ready and your bread is rising nicely, you can refrigerate the starter. When you want to bake bread, remove the quantity needed and use it cold from the refrigerator to mix up the bread recipe. Leave the remaining starter in the refrigerator, and when it becomes low, use the recipe from Day 5 to refresh and replenish the starter, always letting the starter rise after refreshing for 6 to 8 hours. For the first two months, you should refresh your starter once a week to keep it strong, then you can store it longer without refreshing. If you need a larger batch of starter for more baking, you can double the recipe for refreshing and follow the same instructions. Please contact us with any questions or concerns you might have during this process. We wish nothing more than for your starter to work perfectly and for you to enjoy healthier and more delicious gluten free bread. Good luck! When your starter is ready, give one of these sourdough bread recipes a try. More coming soon! I am so excited to start this process! My clients who are gluten-free will love this. Thank you!! Awesome, let us know how it goes. Just wondering if the amount you discard each day could be used to bake cookies or make pancakes? I understand this is necessary for the process, but it seems like it should work to re-use in recipes? You can add the starter to pancake batter, or any bread recipe. The first three days I wouldn’t though, as it has an off-flavor. Go by smell, when it starts to smell sweeter, you can use the discard. Only one can be correct. I used grams but it seems a bit thick so read more closely and wanted to check. Thank you for great products and a way back to sourdough bread! Both are correct, 1/4 cup of water weighs 60g and 1/3 cup flour 40 g. It is always best to use a scale and grams, so it sounds like you are doing things right. The starter does get stiffer as you go along. That makes it rise slower, so it can be preserved in the refrigerator later on. I think my starter is doing great—day 6 today! I do have a question concerning the timing after day 5, and before the starter is used to bake. The instructions above say not to let the starter sit at room temperature longer than 8-12 hours, but not to refrigerate until it bubbles and doubles in size within 6-8 hours. Does it need to be refreshed morning and evening (12 hrs) after day 5, until the bubbling within that time frame is achieved? After 5-6 days, if you have nice bubbling, you can refrigerate your starter or leave it out for 24 hours after refreshing. If it is having trouble, twice a day every 12 hours is recommended. Sounds like your is almost ready for bread baking. You can refresh it in the morning, leave it out until early evening, then refrigerate overnight. Once your bread rises well, you can refrigerate for longer periods. On day 2 my starter had good bubbles after 24 hours. Now on both day 3 and 4 nothing has happened. No bubbles or expansion. I followed the directions (or thought I did). Do I need to start over? Keep going – there may be a period when the pH and acid levels are adjusting and you will not see as many bubbles, but continue to refresh and you will see them again! On day 4, I had to let my starter go 30 hours ( I was away till late that day) It bubbled over, and had a stronger smell. Now day 5 it seems like nothing has happened. Dense and flat. Do I need to start over? Just start refreshing and you should see the bubbles return fairly quickly. When this starter is ready to use, can it be used with other brands of gluten free flour also or only Jovial flours? We developed the starter and all recipes for our own flour which has no added starches. You would have to experiment. Today is Day 5 so I am going to start to refresh the starter. I understand the amounts to use but I’m confused about when to start to refrigerate. I think that I’m supposed to refresh every day (using the day 5 instructions) until it bubbles up and doubles in size — and that can take anywhere from 5-10 days. During that time after 5 days but before it doubles in 6-8 hours I should refresh the starter every day…and after the about 12hours (whether it has doubled or not) refrigerate it. After 12 hours of refrigeration refresh starter and repeat the process until it doubles in size. Then I can start baking bread and will keep it refrigerated all the time unless I’m refreshing it to create more starter. Is this correct? Once your starter bubbles up within 6 to 8 hours of refreshing, you can store it in the refrigerator in a sealed container. Until then, leave it at room temperature. Recipe Egg and Dairy Free Boule asks for one batch of levain. Is levain and starter the same? How much is one batch? The levain is made from the starter. The recipes have links, but here they are again. Good luck! Can I leave it at room temp indefinitely if I feed it every day? Mine is going on three weeks room temp and is doing beautiful. Smells like fresh bread. Yes, but eventually, a little refrigeration won’t harm your starter. Sixty days at room temperature with constant refreshing is great, but after that, don’t be afriad to refrigrate. Good luck! I’m excited to make GF sourdough bread for my granddaughter. She misses eating sourdough. When do I stop tossing the starter? Since day 5 I’ve been taking just 2 tsp from my starter each day & throwing the rest out. I’ve done this for 6 days. I’ve been reading other refreshing instructions & they add equal amounts of water & flour to the jar of starter. I’m confused. Keep refreshing until the starter bubbles up within 5 hours of refreshing, then you can refrigerate and refresh 1X per week. Our starter is not liquid like other starters might be, so just follow the instructions for weighing the ingredients and it work just like a more liquid starter. I followed your instructions for 4 days and started to refresh on day 5. For about 6 days, bigger bubbles formed but it did not rise after 6-8 hours. Then on day 7 the bubbles were smaller, and n day 8 — almost no bubbles. Today (day 9) again almost no bubbles and more dense. I decided to refresh after 18 hours, and then will refresh in another 12. I have to go out of town for a few days, leaving in 3 days. I’m wondering if it makes sense to keep wasting flour on this starter. I’ve used more than 1/2 box of flour already. Can Ieave this in the fridge when I go away even if not bubbling well? Or should I just start over when I get back? Yes, you can store it until you get back and start refreshing again when you return. The process can take time, but bubbles are an indication that fermentation is happening, so don’t quit! Thank you, hope to see you there one day! Thanks, so no bubbles in the last two days. I put the starter in the fridge today. When I return and take it out of fridge, is it best to use the original proportions (25g starter, 45g water, 30g flour) or the the “refreshing” proportions (10g starter, 60g water, 40g flour)? I have followed the directions precisely, using digital scale. It was going great. I started to refresh on day 5 and it was nice and fluffy and has smelled the same the entire time. I continued to refresh every 24 hours because it was not doubling in size within the time frame stated. On day 9 I went to refresh and it was just flat glob at the bottom of the mason jar (but still smells the same. No bubbling. I refreshed it anyway. I usually refresh around 2pm… looking at it today (day 10) at 9am it is still a flat glob. DO I NEED TO START OVER? Or does it need to be warmer. we keep house at 68. The kitchen is more like 72 but we’ve left a window cracked at night the past 2-3 nights. You do not need to start over. It is important that the temperature be at least 68°F. Keep going and let us know your progressing!